Gabor Doka pointed me to a publication by the Swiss EPA (Federal Office for the Environment, FOEN). The publication titled “Biogene Güterflüsse der Schweiz 2006” (‘Flows of biogenic goods in Switzerland in 2006’) features many different Sankey diagrams. “Biogenic goods are defined as goods of biological origin, excluding those of fossil origin”. Data is based on Swiss statistical figures and valid for 2006. Available in German only (Download PDF 7,5 MB). 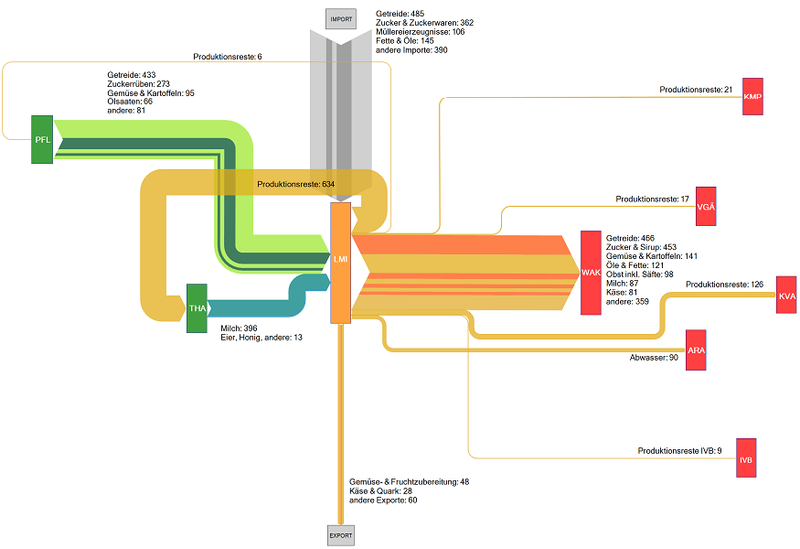 The main diagram is then broken down into individual Sankey diagrams for the different sectors involved, such as plant production (PLB), animal farming (THA), and forestry (WAW) in the production column (orange colored processes), or food industry (LMI) and wood/paper industry (HPI) in the conversion sector (green colored process). Finally, in the use/disposal sector (red colored processes) we find goods consumption (WAK) along with energy generation and waste treatments. This is the sectoral Sankey diagram for the food industry in Switzerland. We can see that a large part of the biomass for food production is imported, and that most production wastes are fed back into animal farming again. The red boxes are different waste treatments receiving input from the food industry. The above is the goods consumption section. Main biogenic goods inputs are from food industry and wood/paper industry. The meat input is rather small comparatively. A big chunk of the mass output (namely waste wood and waste paper) feeds back into the wood/paper industry. 472.000 tons ended up in waste incineration that year, some 329.000 tons in waste water. 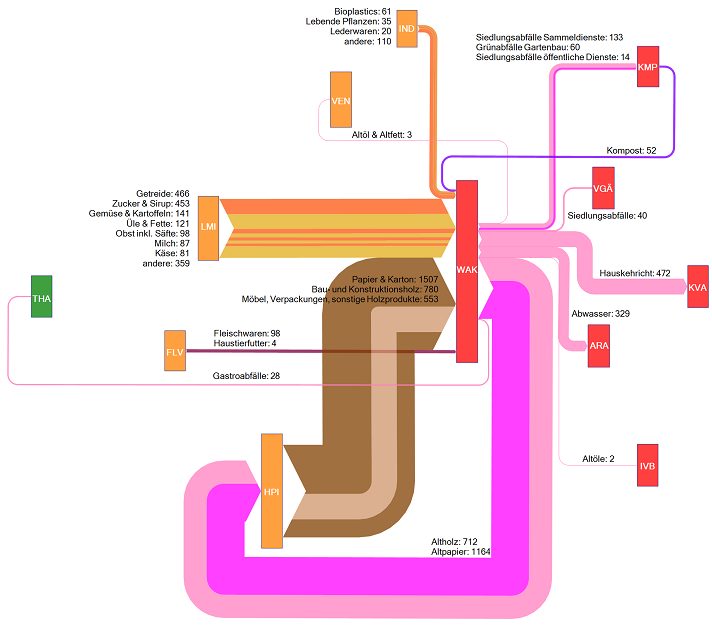 The Sankey diagrams in the study are interesting to browse and reveal a lot more interesting facts. The stuctured approach with the breakdown into smaller diagrams is very useful. The authors Baier and Baum from ZHAW at Wädenswil have done a great job in compiling this. “The results of this study will serve as useful decision aids for strategic planning and assessments concerning the potential, use and management of biogenic resources (…) makes it possible to detect quantitative changes that occurred during a given period of time and to reach conclusions concerning the efficiency of measures taken. Actually this way of visualizing statistical data with directional (from-to) information attached to it could serve as a role model for other national mass and energy accounts, I think. Uh – this has become my largest post ever 😮 . But I think this was well worth it and the publication merits it. Your comments appreciated. A followup to my last post: This thread on ‘The Oil Drum: Europe’ features similar national energy flow diagrams for UK (2007), The Netherlands (2006) and Switzerland (2007). For the UK these Sankey diagrams are published by BERR (Department for Business, Enterprise and Regulation). Historic charts back to 1974 can be found on their website. These Sankey diagrams have some nice details, which a worth a mentioning: The UK diagram shows stock increases and decreases with circles. The size of the circle has no significance, but the magnitude of the in and out flows seem to be to scale, thus allowing to see if the stock has increased or decreased in that year. 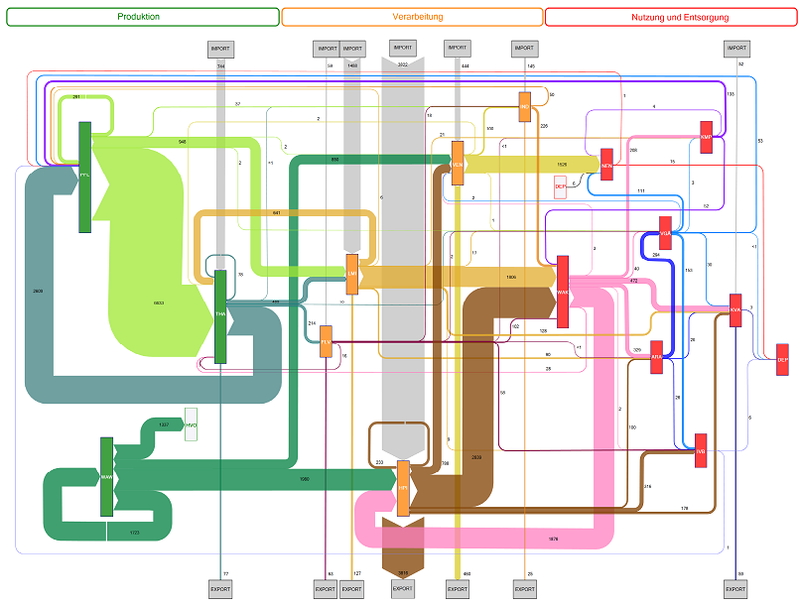 Losses at transformation steps are shown with “hanging arrows” (the flows branching off to the bottom line of the diagram). The Swiss version also shows exports this way, but visualizes losses with a pin with a big round head. Even though your run the risk of being overwhelmed by a gloomy feeling when your read through the comments to Chris Vernon’ post, I would like to draw your attention to a comment by “realist” on Sept 5. He writes: “Deceptive graph! 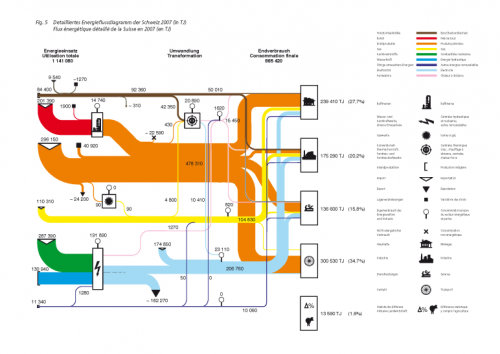 Why show losses for electric power generation and not transportation? The heat losses from the internal combustion engine in most transport is 70-80%”. 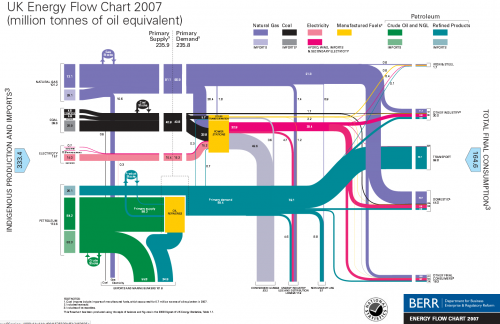 This is true, but I have always understood that losses explicitly shown in these energy flow Sankey diagrams are the losses occuring in the energy generation, conversion and grid, while losses in the energy consumption (such as use for transport) are not shown. This let alone that they are worthwile to discuss.